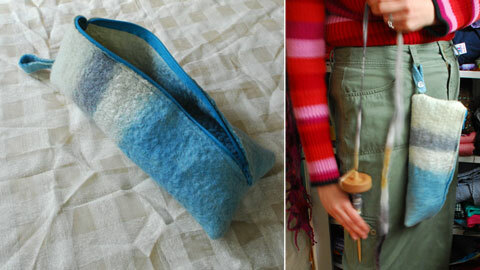 Working from Loren’s great suggestion yesterday, I sewed up the next two spindle cases with a strap. Made in the surf colorway with bamboo and tussah silk roving for accents, this case features a button strap. It measures 10″ x 5″. I reversed the opening for this one just to see how it would work, but until I try actually wearing it for a while I’m not sure which is preferable. The next version was sewn with a closed loop. If I were wearing a belt, I would thread it through the handle, but since I don’t usually wear one, the carabiner worked just as well. The flat felt was made with a merino cross roving in indigo on one side, and pinot noir blue faced leicester on the other side. It also measures 10″ x 5″. I finally remembered to sew a SpiderFelt tag into this fourth prototype. The coolest part of this case is the stripe of grey made with carbonized bamboo fiber (added as an afterthought, will remember to layer it over a brighter roving next time). The roving feels soft and supple with a hint of shine. The color is achieved by heating the bamboo fiber. Very neat stuff.